They may have enjoyed a night out in Soho last night, but that didn’t stop Russell Brand and girlfriend Isabella Brewster from getting up bright and early today. The pair were spotted out and about in London as they took a trip to London’s Tate Modern together. Russell, 37, obviously wanted to show Isabella what the Capital had to offer and was in very good spirits as he did so. As the happy couple strolled in the sunshine, the comedian was seen shaking hands with a passer by who had obviously noticed who he was. Russell was wearing his usual attire of ripped skinny jeans, battered-looking boots and a brown leather jacket. 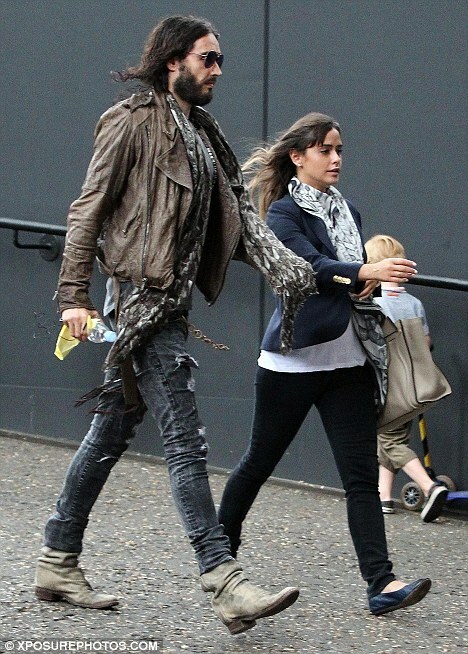 He completed his look with aviator sunglasses and a long scarf – similar to the one that Isabella was also wearing. The brunette has dressed casually for the day out opting for black skinny jeans, a navy blue blazer and pumps. As she carried a large handbag, the 23-year-old stayed close to her beau’s side at all times. The couple were later seen holding hands as they prepared to marvel at some art. They’ve only been dating a few weeks, but it seems that their relationship is quickly getting serious after Isabelle joined Russell in the UK.